Whether we love sports or not, most of us a drawn to the Olympics in some sort or fashion. We find ourselves drawn to sports that we have very little knowledge of, fascinated by the athlete’s backstories and their single-minded pursuit of their dream. So take this subject and throw in a romance, well, yeah I’m totally going read that. 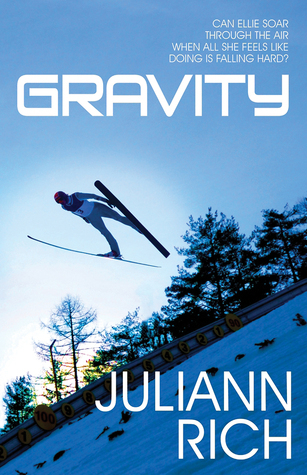 Ellie Engebretsen is a seventeen year old Olympic hopeful in the ski jump. Finally, the Olympic committee has agreed to allow women to compete in this event. (Side note: women have been ski jumping for over 100 years, but it was finally included in the 2014 Sochi Olympic Winter Games.) Her father competed years ago in this discipline ad has been grooming her since birth to be the next champion of the sport. When we meet Ellie she is recovering from a broken heart. Her girlfriend has run off with a fellow teammate, who happens to be a guy. To make matters worse she runs into them sucking face all over her mountain in Lutsen, Minnesota. Enter Kate Moreau. Kate becomes Ellie’s rebound fixation. These two meet, hookup and are never supposed to see each other again. Yeah, okay, totally doesn’t happen that way. Kate ends up moving to Lutsen and taking a part-time job at the Engebretsen’s pro shop. Kate is tough, keeping her heart locked away. Abandoned by her father, and being raised by her free spirit mother, Kate doesn’t take anything from anyone. Self-reliant and fearless are two easy ways to sum this teen up. So what did I think? This one is kind of a conundrum to me. The writing overall is done fairly well. I thought the relationship development was kind of shallow, but not bad. What stuck out to me the most, and I wrestled with, was the dialogue. Ellie for a seventeen-year-old is way over the top crass. I couldn’t buy that this was a teenager. I think her dialogue kept throwing me out of the story. The final chapters were way over dramatic, unnecessary conflict that didn’t make the story more enjoyable. Now with that being said, I would still read another book by Juliann Rich, I am interested to see how her other characters will be developed.